"This artful and autumnal novel, published in high summer, is a gift to those who wish to receive it." "Hilarious, heartbreaking . 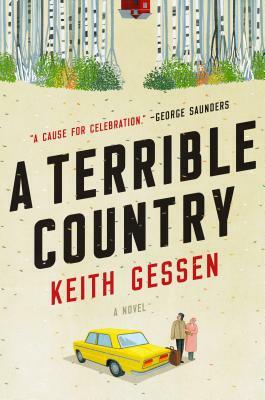 . . A Terrible Country may be one of the best books you'll read this year." "The funniest work of fiction I've read this year." When Andrei Kaplan’s older brother Dima insists that Andrei return to Moscow to care for their ailing grandmother, Andrei must take stock of his life in New York. His girlfriend has stopped returning his text messages. His dissertation adviser is dubious about his job prospects. It’s the summer of 2008, and his bank account is running dangerously low. Perhaps a few months in Moscow are just what he needs. So Andrei sublets his room in Brooklyn, packs up his hockey stuff, and moves into the apartment that Stalin himself had given his grandmother, a woman who has outlived her husband and most of her friends. She survived the dark days of communism and witnessed Russia’s violent capitalist transformation, during which she lost her beloved dacha. She welcomes Andrei into her home, even if she can’t always remember who he is. Andrei learns to navigate Putin’s Moscow, still the city of his birth, but with more expensive coffee. He looks after his elderly—but surprisingly sharp!—grandmother, finds a place to play hockey, a café to send emails, and eventually some friends, including a beautiful young activist named Yulia. Over the course of the year, his grandmother’s health declines and his feelings of dislocation from both Russia and America deepen. Andrei knows he must reckon with his future and make choices that will determine his life and fate. When he becomes entangled with a group of leftists, Andrei’s politics and his allegiances are tested, and he is forced to come to terms with the Russian society he was born into and the American one he has enjoyed since he was a kid. A wise, sensitive novel about Russia, exile, family, love, history and fate, A Terrible County asks what you owe the place you were born, and what it owes you. Writing with grace and humor, Keith Gessen gives us a brilliant and mature novel that is sure to mark him as one of the most talented novelists of his generation. Keith Gessen is the author of All the Sad Young Literary Men and a founding editor of n+1. He is the editor of three nonfiction books and the translator or co-translator, from Russian, of a collection of short stories, a book of poems, and a work of oral history, Nobel Prize-winner Svetlana Alexievich's Voices from Chernobyl. A contributor to The New Yorker and The London Review of Books, Gessen teaches journalism at Columbia and lives in New York with his wife and sons. "This earnest and wistful but serious book gets good, and then it gets very good. . . . [Gessen] writes incisively about many things here but especially about, as the old saw has it, how it is easier to fight for your principles than live up to them. . . . This artful and autumnal novel, published in high summer, is a gift for those who wish to receive it." "Excellent. . . . In its breadth and depth, its sweep, its ability to move us and philosophize . . . A Terrible Country is a smart, enjoyable, modern take on what we think of, admiringly, as 'the Russian novel'—in this case, a Russian novel that only an American could have written." "[A] lighthearted yet morally serious novel." "Hilarious, heartbreaking . . . A Terrible Country may be one of the best books you'll read this year. . . . One of the pleasures of the novel is listening to Andrei's hyper-intelligent, wry and ironic voice. . . . The other unforgettable character is Andrei's grandmother, an indomitable force of nature. Gessen's portrait of her is tender, and readers will be hard-pressed to find a more nuanced and poignant depiction of what it means to lose your memory. . . . Gessen's genius is in showing us how and why Russia is and isn't a terrible country. And how, in its ruthless devotion to market capitalism, the former socialist state bears a striking resemblance to our own." "[Andrei's] wry observations about Moscow's day-to-day—his tour through his own family history, his grandmother's stuck-in-time apartment, his struggle to join hockey games and party in nightclubs—are completely engrossing. It's portraiture, showing us a place we may think we know but don't . . . A Terrible Country is a splendid guidebook." "My own feelings towards this complexly ambivalent novel aren't complex or ambivalent in the least. I loved it and expect others will too." "A Terrible Country is filled with moments of levity. . . . Gessen has shown how literature, academia, and anti-capitalism—topics often pushed to the periphery of political debate—have in fact much to say about the dehumanizing effects of neoliberalism. Tolstoy, who by the end of his life opposed private property, renounced the copyright to his literary works, and started a school for peasants, would probably like it." "Laser-true and very funny . . . Gessen evokes not only convincingly, but indispensably, something exceedingly rare in modern American fiction; genuine male vulnerability. There's enough heart here to redeem every recent male novel that's aimed for it and found solipsism instead . . . You won't read a more observant book about the country that has now been America's bedeviling foil for almost a century." "Wily, seductive and deeply affecting. . . . Gessen brilliantly captures the daily rhythms, allures and challenges of Moscow life in 2008-2009. It's as personable a book as it is political. . . . A great book with a great heart." "Funny and incisive. . . . Marvelous. . . . A Terrible Country is a contemplative and compassionate novel about what it means to return to a place that is no longer home, and a fiercely political book about what oppressive regimes do to societies. There are few writers that do either as well as Gessen does both." "A fresh and often very funny perspective on contemporary Russia." "A Terrible Country . . . has a spare emotional force, as beautiful as it is paintful; [the novel] serves as a keen document of history past and present; builds in an unlikely way to the suspenseful climax of a taut (and very human) political thriller; and is the funniest work of fiction I've read this year." “Taking such an intimate trip through the recent past of Putin's Russia is fascinating, made more so by the presence of Andrei's lively, sorrowful, unpredictable grandmother." "What is everyday life like under Putin's rule? Russian-born Gessen, founding editor of n+1 magazine, draws on his first-hand experiences to paint a vivid picture of Moscow circa 2008." "A Terrible Country positions complacency against resistance, and questions what 'home' really means." "Like Gessen himself, Andrei ends up spending time back in Russia, a nation perhaps even more totalitarian than it was when his parents fled almost three decades earlier. He falls in with a group of anti-Putin socialists—a turnabout that, eventually, indicts the values of his adopted homeland." "[A] funny and very perceptive portrait of a grandson, a grandmother and a complicated country." "A novel where Russia—a character so compelling that it could have sucked the air out of the room—is merely the landscape on which an even more compelling story plays out—about a human being, and his grandmother." "A novel about life under neoliberalism. . . . A Terrible Country is not exactly a hopeful book about political protest, but neither is it a fatalistic one. Instead, it suggests what resistance might mean, not as a slogan, but as a life." "Sad, funny and altogether winning. . . . A compassionate, soulful read that avoids dourness by being surprisingly funny. A Terrible Country shows us that while you certainly can go home again, it often turns out to be a lousy idea." “Gessen's first novel in a decade is both a piercing look at contemporary Russian society and a touching story of the struggle to find your place in the world." uncopyedited version of the manuscript"